Parent Connection Newsletter August 2017. All fees are due on MONDAY’s. By noon on Tuesday’s you will be charged a late fee. If you have not submitted up to date shot records and physicals they are needed by August 15, 2017. NO SHOTS, NO SCHOOL, NO KIDDING! Hours of operation are 6:30am -6:00pm. Child Care of Southwest Florida follows the Lee County School Board Bad Weather Closing Schedule. Please tune into your local weather station. If school is called off or closes early the center will follow suit. Please be prepared for alternative care in the event of bad weather closures. P.A. Geraci, is now a 5 Star QRIS (Quality Rated Improvement System) rated program! 5 is the highest rating a center can receive and we did it. What does this mean, it means your kids are learning, our teachers and staff are trained and qualified to deliver a quality education to your kids. We have never been a 5 Star program, but we are now! Please congratulate your child’s teacher when you see them. Congratulate yourself for your support and dedication to P.A. Geraci. Thursday, August 10th — First day of class for VPK 2017-2018 school year. We welcome all new students to our center, wishing you all a great school year. Summer's been great--swimming in the neighborhood pool, playing until dark, going to bed late at night, sleeping in every morning. Now, in a very short time, the routine has to change. What can you do now to make going back to school a pleasure, not a nightmare of nagging and yelling, delaying and dawdling? • Start getting kids in bed early. Begin a week before school gets underway. You can't force them to sleep, but you can see they're snuggled in bed looking at books. Lay out the clothes for the next day and lunch too. • Get yourself up and ready first. If you work outside the home, this step is crucial. All goes more smoothly those first days when you're available to guide your children each step of the way. You're a busy parent. You might have one maybe even two jobs, attending classes to further your education, or other responsibilities that require you to find child care. While daycare is what most parents are familiar with, a quality early learning center is the best option for parents and their children. For many children, an early learning center is their first experience in a purposefully structured setting with teachers and other groups of children. It's an opportunity for them to learn to share, follow instructions, interact with other children, and soak up the tools they'll need to succeed in the future. 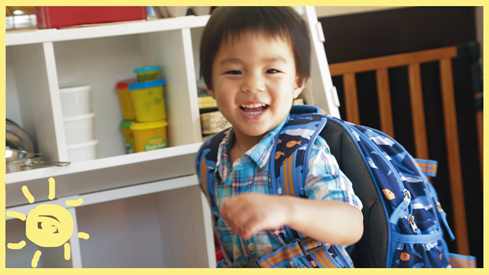 Early learning centers are more than simply places that take care of your child while you're at work or school, they give children the tools to succeed in the future. Here are seven important reasons your child should attend an early learning center. 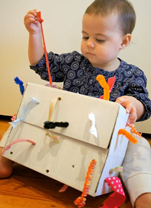 Cheap ideas to try at home with your little ones! Use any old box and poke holes in it. From the inside tie a knot on the ribbon or string and pull it through the box. Tie the other end and enjoy tugging at the strings. 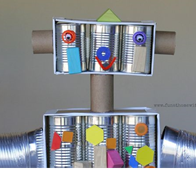 Make a robot out of recyclable loose parts found around your house. 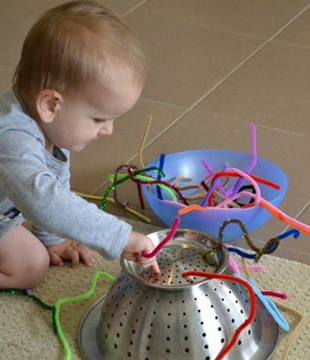 Practicing your fine motor skills with pipe cleaners and a colander. 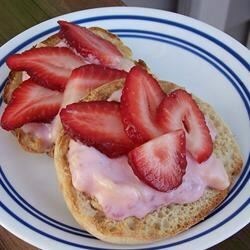 "Served as a light, refreshing warm weather snack, or as an accompaniment to brunch, these English muffin, strawberry and pineapple treats are delicious." Lightly toast the English muffin halves in a toaster. Spread each half with pineapple yogurt. Top each half with strawberries and pineapple. Serve while English muffins are still warm.